Even though the development of competition law in the countries of the former Eastern bloc has been based to a significant extent on arrangements existing in the European Union – including the case law of European courts and various instruments developed by the European Commission – numerous substantial differences remain both in regulatory regimes and in ongoing practice among the various countries. This first-ever practical survey of competition law in this region describes applicable regimes in sixteen of these countries, with additional country chapters on Austria and Turkey and a chapter on the role of the Eurasian Economic Commission. 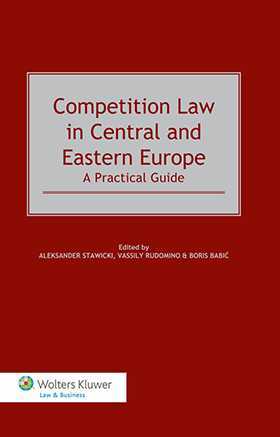 As a guide to the “landscape” of competition law in Central and Eastern Europe, this book has no peers. Its authors describe the role competition plays in each country, while also providing insight into the actual capacity of bodies appointed to protect the freedom of economic activities. The book will be of inestimable value to professionals in this area of legal practice, whether in law firms, corporations, academia, government, or the judiciary. List of Editors and Contributors. Preface. CHAPTER 1 Austria Florian Neumayr. CHAPTER 2 Belarus Tatiana Ignatovskaya. CHAPTER 3 Bulgaria Nikolai Gouginski & Anton Petrov. CHAPTER 4 Croatia Boris Babic, Boris Andrejaš & Joško Perica . CHAPTER 5 Czech Republic Ivana Halamová Dobĩsková. CHAPTER 6 Estonia Tanel Kalaus & Martin Mäesalu. CHAPTER 7 Hungary Anikó Keller, János Vajda, Miklós Boronkay & Bence Molnár. CHAPTER 8 Republic of Kazakhstan Aidyn Bikebayev . CHAPTER 9 Latvia Dace Silava-Tomsone & Sandija Novicka. CHAPTER 10 Lithuania Irmantas Norkus & Ieva Sodeikaite. CHAPTER 11 Poland Aleksander Stawicki. CHAPTER 12 Romania Catalin Grigorescu, Cristina Mihai & Iulia Cojocaru. CHAPTER 13 Russia Vassily Rudomino, Ruslana Karimova, Ludmila Merzlikina, German Zakharov. CHAPTER 14 Serbia Darija Ognjenovic & Tijana Lalic. CHAPTER 15 Slovakia Tomáš Maretta & Marek Holka. CHAPTER 16 Slovenia Pavle Pensa & Simon Gabrijelcic. CHAPTER 17 Turkey Gönenç Gürkaynak. CHAPTER 18 Ukraine Igor Svechkar. CHAPTER 19 Eurasian Economic Area Vassily Rudomino & German Zakharov. Index.